On February 1, National Signing Day commenced throughout the country. High school athletes realized their dreams of playing college sports as letter of commitment were signed. For ASU football, they came away with the 38th best class in the nation. For ASU, this is a great result. Last season, the Sun Devils were ranked 26th in the nation, but that was with the signing of N’Keal Harry, the seventh best receiver in the country. The 2016 recruiting class also featured eight other players who were ranked within the top-10 for their respective positions. This season, the Sun Devils had four players who were ranked within the top-10 for their respective positions. The highlight of those players being Blake Barnett who was ranked as the number one pro-style quarterback in the country. Barnett, who transferred from Alabama after losing the starting job to Jalen Hurts, is projected to give Manny Wilkins a run for his money and challenge him to the starting quarterback position. Outside of Barnett, Eno Benjamin is another recruit that impressed. Benjamin is the running back of the future for Arizona State and giving him a year to learn and develop under both Kalen Ballage and Demario Richard is the right thing to do. While he will see the field, he isn’t expected to be a main contributor to the offense this season. Another recruit for the Sun Devils who has the ability to be an impact player from day one is Tyler Johnson. The All-Arizona player has the ability to play both sides of the ball. At 6’4″ and 245 pounds he could be an effective pass rusher or tight end, both of which he played in high school. If ASU were to use him at tight end, then he could be an effective target across the middle for the starting quarterback. If he were to be put at use on the defensive side of the ball, then he could be a very versatile defensive end. He could rush the quarterback, using his speed to outrun his defender, or he could drop back into coverage and use his hands to potentially pick off a ball or two in the middle of the field. 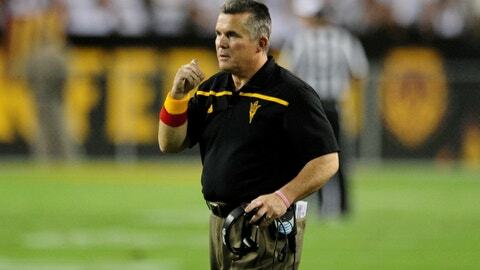 Either way ASU decided to use Johnson, he will be effective. Check back tomorrow as we continue to analyze ASU’s 2017 recruiting class.